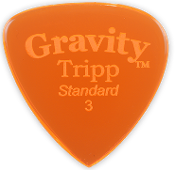 The Tripp is the most versatile pick that Gravity sells. Using the tri-tip model platform, we’ve put a different tip on each end from three of our popular picks. The Tripp has one tip that’s sharp like the Sunrise, giving you the ability to pick or shred, a second tip that’s rounded like the Axis, made for some smooth strumming, and a third tip that is semi-pointed/semi-rounded like the Striker, giving you the versatility to alternate from picking to strumming to any style you play. With this pick you have everything. Not only do you get the ability and option to play different styles, this pick gives you different tones and sounds — from bright, higher frequencies to mid-range tones. You can call it a bargain pick or a great practice tool, but one thing is for sure, the Tripp sounds as good as it looks.